You are in the right place! Start by navigating to the section below that most closely reflects the issues you are experiencing. Can't find a what you are looking for? If you can't find the answer, please contact your partner or MyArchiCAD team to get a personalized solution to your problem. That’s pretty vague. What can I get from MyArchiCAD, exactly? How could I sign up? Hold on … will this cost me money? The following error appears on the registration page: “Somebody has already registered with this email address”. It says “Please enter a valid email address”. My confirmation email didn't arrive. I have previously registered at "http://eduregistration.graphisoft.com", but cannot login to MyArchiCAD with the same account detail. It says “This code has been already used or has been misspelled. Please try copy and paste from the email sent to you.” when I confirm my account. I have downloaded ArchiCAD and obtained a serial number from MyArchiCAD, but it doesn't work. What should I do? When I install ArchiCAD, I get an error message: "ArchiCAD Installer is damaged and can't be opened". When I install ArchiCAD, I get an error message: “some files such as GSRoot.dll, ArchiCAD.exe, etc. are missing”. What should I do? The License Renewal window panel in ArchiCAD does not appear. The renewal panel in ArchiCAD doesn't accept the new serial number, and an error message, “Invalid ArchiCAD student version license”, appears. Often the license file gets corrupted and I cannot continue running ArchiCAD. Are older versions of software available on MyArchiCAD? 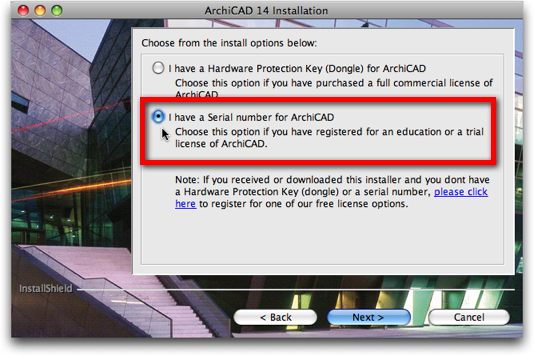 Who is entitled to download ArchiCAD Education Version? What are the limitations of Education Version? What is the turnaround time for a student or teacher get approved for the 1 year license of ArchiCAD? Who is entitled to download ArchiCAD Academic version? How do I find a reseller if I want to buy the commercial license? I have created a file in Trial version. Can I open it in commercial version? I've downloaded ArchiCAD but haven't received a serial number via email. What should I do? My ArchiCAD education license will expire soon. Is it possible to get an extension, so I can keep using ArchiCAD? I’m having problems downloading software from MyArchiCAD because the download link is broken or the downloaded file is corrupted. Whom should I contact for assistance? When I install ArchiCAD, I get an error message: "ArchiCAD Installer is damaged and can't be opened"
I can't save files created in ArchiCAD. It runs in Demo version. How do I find an answer to a technical question not in this list? Do I need a serial number for add-ons? MyArchiCAD is GRAPHISOFT website, where you can find free downloads of ArchiCAD and related products. It allows students, teachers, and schools to download the latest ArchiCAD Education version for free. Professional users can download the ArchiCAD Trial version from the same site for free. Want more? What about ArchiCAD Training Series, the unique BIM Curriculum, and a variety of Add-ons, includes MEP, Cigraph plug-ins? Once you sign up, you will have access to all those downloads, too. Just register here to start! No. It is an absolutely free site. You will never be asked to pay to use the Educational or Trial ArchiCAD or addons. We will only ask your basic information when you create an account. That’s it! Once you've finished the first step of registration, you'll receive a confirmation email. Please click the link in that email to complete the confirmation process. It means the email address you entered has already been used. Use this address to login to the site at any time. If you can't remember your login password, reset it here. If you have registered with Facebook or Google authentication, please use the correponding button on the front page. If you are 100 percent certain that you have never registered with this email address, please report to us by sending an email from this email address in order to prove you are the owner of this email account. If you're getting this error, you may be accidentally putting an extra space in your email address. Sometimes this happens if you copy and paste your email address from another location. It should work if you delete the extra space. There might be other reasons: for example, you're entering '@gmail' instead of '@gmail.com'. In this case, please enter the complete email address. Please check your email application's spam or junk folder or filter. In some cases, our emails are blocked by your ISP (Internet Service Provider). Please talk to your IT about accepting our message or try to register with another email account from a different mail server. If you are still experiencing the issue after the above steps, please contact us. I have previously registered at http://eduregistration.graphisoft.com, but cannot login to MyArchiCAD with the same account detail. Thanks for coming back to us! There is no automatic migration of your data from our old databases. Please register again or contact us. If you're getting this error, it means your email account has already been verified successfully. You can login to the site at any time with your email address and password. If you can't remember your login password, reset it here. For security reasons, we are not able to send your current password. Please reset it here. GRAPHISOFT provides the latest and the previous version through MyArchiCAD.com. Any students or teachers having valid educational status are entitled to ArchiCAD Education Version. Education version is a fully functional as commercial version, but will watermark the project files it creates or saves. A file created with the commercial version of ArchiCAD can be opened in Education version, but it will inherit the Education watermark. If you save the file in Education version, you will still be able to open it in a commercial version, but it will bear the watermark. Please note: The watermark can not be removed from the file by saving it in commercial version. The Educational watermark will appear on every printout. We try to process your application in two weeks. Once you get approved for the 1 year license, you will be notified by email. If you don't hear from us within two weeks, please contact your local GRAPHISOFT partner. Only non-profit academic institutions are eligible to receive an ArchiCAD license free of charge. What are the limitations of Academic version? Please refer to "What are the limitations of Education Version?" After you login to the site, you will find the contact information of your local GRAPHISOFT partner. Trial files can be opened only by the copy of ArchiCAD that created it - this means that such files cannot be transferred to another computer. Once you buy the full commercial license, you need only to insert the protection key into your computer: after restarting the program, the trial license automatically switches to full mode, and the files created by the trial license will be converted to ArchiCAD commercial files, but only on the computer on which they were created. After you convert your Trial version ArchiCAD into Commercial version, make sure you open and re-save all your trial version files. You can do this only with this copy of ArchiCAD. Files created in the ArchiCAD trial version cannot be opened in ArchiCAD Start Edition. For security reasons, we don't send you the serial number by email. Please find your serial number on the My Products page after login to the site. Students and teachers are entitled to extend the free education license for academic use as long as they maintain their educational status. You can renew your educational license 30 days before it gets expired by pressing the process start button at the top of MyProducts page. The License Renewal window panel does not appear . This happens when you are running Windows 7 operating system. In this case, you must install the latest hotfix before renewing the license. The license renewal panel in ArchiCAD doesn't accept the new serial number, and an error message, “Invalid ArchiCAD student version license”, appears. Often the license file gets corrupted and I cannot ccontinue running ArchiCAD. Please check your Internet connection stability before downloading. We recommend to use a download manager. If you are stil having problems contact your partner for assistance. There might be something preventing the installation from completing. Please disable any virus scanners and reinstall using full admin rights. With those settings you can control which applications are allowed to be installed on the computer. For the current GRAPHISOFT products the default Mac App Store and identified developers is a good choice, but older versions and the protection key drivers may not be installed using this security option. I have downloaded ArchiCAD and obtained a serial number from MyArchiCAD, but it doesn't work. I get a warning sign. What should I do? The most common reason is the user has entered an extra space after the User ID, which is his/her email address. Meanwhile, the user should also be aware that the serial numbers are language version dependent (e.g. the serial number generated for International version cannot be used for Spanish version). This happens because you chose the wrong option during the installation of ArchiCAD. Find additional information here, or consult an expert on the forum. No. They are free for educational and trial use. Where can I find answers to technical questions about add-ons? or consult an expert on the forum.